In his praise for Part I of Upbuilding Discourses in Various Spirits, the eminent Kierkegaard scholar Eduard Geismar said, 'I am of the opinion that nothing of what he has written is to such a degree before the face of God. Anyone who really wants to understand Kierkegaard does well to begin with it.' These discourses, composed after Kierkegaard had initially intended to end his public writing career, constitute the first work of his 'second authorship.' Characterized by Kierkegaard as ethical-ironic, Part One, 'Purity of Heart Is to Will One Thing,' offers a penetrating discussion of double-mindedness and ethical integrity. Part Two, 'What We Learn from the Lilies in the Field and from the Birds of the Air,' humorously exposes an inverted qualitative difference between the learner and the teacher. In Part Three, 'The Gospel of Sufferings, Christian Discourses,' the philosopher explores how joy can come out of suffering. Start reading Kierkegaard's Writings, XV, Volume 15 on your Kindle in under a minute. These upbuilding discourses display Kierkegaard's prowess as a spiritual writer. Although he goes to extreme lengths to make the reader aware that he does not possess "authority," that is, he does not write with the authority of an ordained minister, Kierkegaard nevertheless remained a preacher at heart. And his upbuilding (or edifying) writings carry all the weight of eloquent, lyrical and hard-hitting sermons. His concern throughout consistently focuses on "that single individual," the ideal reader, who will act on Kierkegaard's prompting to live as a particular self before the Eternal, taking seriously his or her responsibility to do all and to suffer all for the Good -- and to undertake this task with the urgency that comes at life's 11th hour. Eternity is serious business for Kierkegaard, and you can't escape his demanding call to earnestness as you read these discourses. "Purity of Heart Is to Will One Thing" ranks as the crowning upbuilding discourse of Kierkegaard's so-called "second authorship," in which he wrote specifically religious or Christians addresses in his own name. That edifying gem is included in this collection, and is alone worth the price of the book, translated by Edna and Howard Hong. The Hongs' heroic undertaking of translating and annotating all of Kierkegaard's writing deserves nearly as much acclaim as do Kierkegaard's penetrating insights into the human condition. The Hongs' translations are engaging, thoughtful and thoroughly documented. Their expertise adds deeply to the readers' understanding of the complex, original and far-reaching ideas of Soren Kierkegaard, the greatest philosopher of the 19th century, and, in my view, the greatest Christian philosopher. 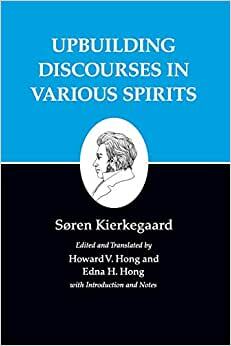 If you want to come to know Kierkegaard the preacher, whose sensitivity to his readers' (or hearers') eternal vocation is genuinely heartfelt, there is no better place to start than with the "Upbuilding Discourses in Various Spirits." 5.0 out of 5 starsAlmost new! I got this book on time and in a excellent condition. I really thought it was new! Looking forward to getting more books from you! Translated by Howard & Edna Hong. Purity of Heart is the first of these discourses. SK explores how we might become more single-minded. This is the first book to present the concept now called Authenticity. "Becoming More Authentic: The Positive Side of Existentialism"
is largely an interpretation of this small book by SK. Chapter 19 is called: Soren Kierkegaard: Willing One Thing. "Becoming More Authentic: The Positive Side of Existentialism".